This new path-to-purchase has led to the creation of what Google calls “micro-moments,” giving brands new opportunities to shape customer decisions and preferences. In this first part of Anvil’s mobile series, we take a look at “I-Want-To-Go” micro-moments. Micro-moments occur when someone instinctively turns to their smartphone to act on an impulse. Those impulses include wanting to learn something, do something, watch something, or buy something. “I-Want-To-Go” micro-moments (do something) are searches that help businesses capitalize on potential customers that are already nearby and searching for their particular service or a product in their inventory. Where in the past customers would find information with a combination of Yellow Pages, a map, and calling up a business, today they can accomplish the same process with a simple search. “I-Want-To-Go” micro-moments are perfect for local brick and mortar stores to address customer concerns both locally and outside of your area. What does this look like for brands? Kent is taking his employees out to lunch. 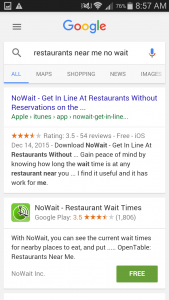 The line at his usual restaurant is too long, so he does a Google search on his phone for “restaurants near me no wait” and sees an ad for “NoWait” an app that will tell him the current wait times at restaurants AND add his name to the list before he gets there. Kent downloads the app. Josh is headed to Los Angeles on a 3-day business trip. While boarding the plane he spills coffee on his suit! Now, he needs to find a dry cleaner in Los Angeles. 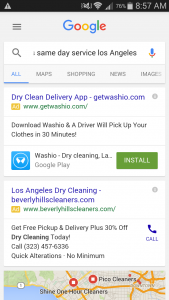 He pulls out his phone and does a search for “dry cleaners same day service Los Angeles” and sees an ad for “Beverly Hills Cleaners”. They even do free pick-ups and delivery! 1 The Consumer Barometer Survey 2014/2015, U.S., n=1,000, based on internet users.